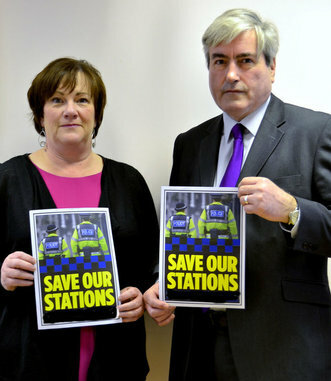 Iain Gray MSP and Fiona O’Donnell MP have submitted a joint response to the Police Scotland consultation on the future of police public counters, in which they reiterate their strong opposition to the proposal to close the public counter at Tranent police station. Mr Gray and Ms O’Donnell’s response to the public counter review highlights their concerns about the potential impact of closing the public counter in Tranent. 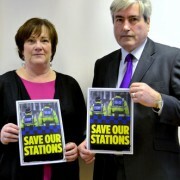 Apart from the short consultation period, the parliamentarians also raised concerns about the methodology of the review and the figures produced by Police Scotland on the current usage of the county’s stations. They also highlighted fears about the potential impact on vulnerable adults who rely on access to police services, and local people’s concern that closing the station to the public could be the ‘thin end of the wedge’ with the next step being to close it entirely. Their submission also raises various concerns about the proposals for withdrawing the county’s two police traffic wardens. Mr Gray and Ms O’Donnell also welcomed the decision by Police Scotland’s Chief Constable Stephen House to agree to accept further submissions to the consultation beyond the 31 October deadline. The move followed pressure from Labour MSPs, including Mr Gray, who had made it clear that a one month consultation period was insufficient to allow meaningful engagement with local communities on such important and far-reaching decisions. “With almost £140 million being cut from the police budget over the next two years by the SNP, I fear that counter closures will be only the beginning. If Tranent police station public counter closes now, will the station itself be next in line for the axe? I know from speaking to local people that the more they hear about the closure the more concerned they are. “Closing Tranent counter is a major step and has caused significant concern among local communities in Fa’side. We have already made our concerns clear to Police Scotland, particularly on the reliability of the figures produced by Police Scotland to support their proposals and the many unanswered questions about the impact of closing the public counter in Tranent.